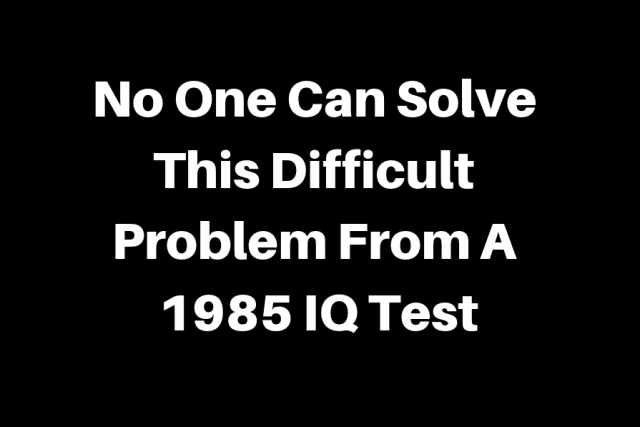 We gave this difficult problem from a 1985 IQ test to 280 American college students and no one was able to solve it. Can you? Genius, you got it right! We gave this difficult problem from a 1985 IQ test to 280 American college students and no one was able to solve it. A man is looking at a photograph of someone. His friend asks who it is. The man replies, "Brothers and sisters, I have none. But this man's father is my father's son." Who is in the photograph? – The man's son. Since he doesn’t have any brothers or sisters, the statement my father’s son is himself. If the man’s father is myself, I am the father of the man in the picture. Therefore, he is my son. Got it?